One of the key drainage issues, which must always be considered, by contractors, installers and maintenance engineers is that of the health and safety of employees and operatives. The Axedo chambers are designed to be installed at depths of up to 6m and comprises of a base unit available in various channel configurations, with shaft, sealing ring and restrictor cap. 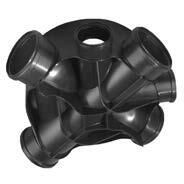 The shaft is finished at ground level with a cover slab and cover also available from JDP. 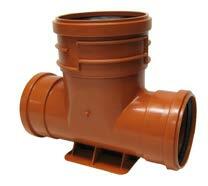 The base unit is available with various sized connections to all main UK pipe systems including Adoptable Sewer, HDPE Twinwall and Clay. 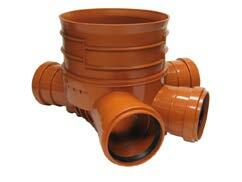 Other pipe systems and sizes can be accommodated with the use of adaptors or inlet reducers. Flexibility to adapt to site conditions is provided with integrated deflection sockets accommodating for angular movement. 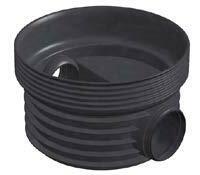 Include use as demarcation chambers or main sewer or surface water inspection chambers.